Jesus is fulfilling Messianic expectations as he enters Jerusalem cheered by the crowd. 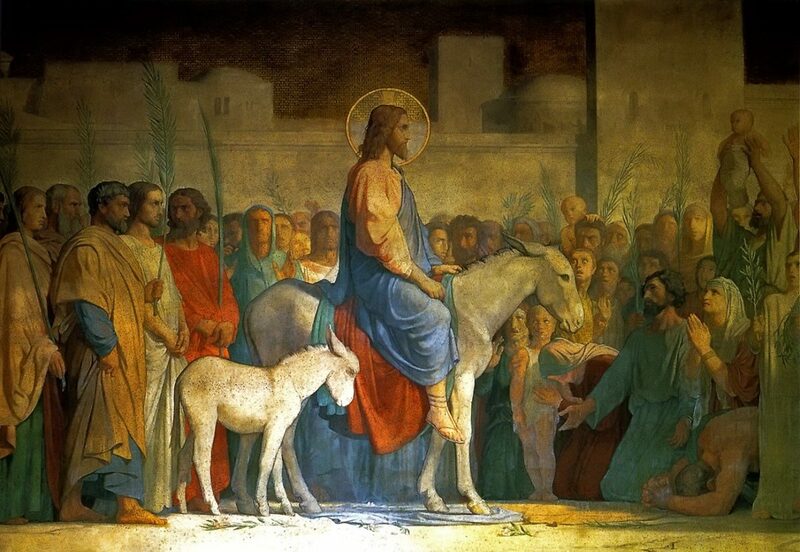 He comes from the East to restore the temple (Ez 43), he is riding a donkey (Zech 9:9), he acts as a King and the people acclaim his kingdom and mission in the things that they say. But Mark’s account ends with an anticlimax, Jesus arrives in the temple as the prophets foretold, but he isn’t welcomed as the Messiah; in fact, nothing happens at all. After looking around, Jesus leaves to spend the night in Bethany. Even though he fulfilled every requirement, the people of Jerusalem didn’t recognise him. God would reassure us that, whether the world recognises Jesus as its King or not, his reign is the fulfilment of history. It’s easy to be cowed by anti-Christian sentiment or indifference, but Jesus is the one for whom all things exists, he is in charge of history, and one day everything will accord with his perfect rule. We are reminded of the privilege of being able to cooperate with God. The characters in the passage fulfilled God’s plans without knowing it. In contrast, we know what kind of Kingdom God is establishing, we have seen the cross and the empty tomb, we have been filled with the Holy Spirit. We know that in all circumstances God is revealing his love, that he can turn all things to good for his glory and our blessing, that his love will never fail or change. So, when we face challenges of every kind we know that there is a response of faith that brings us deeper fellowship with him, displays his love to the world and brings him glory. With this insight, when we face trials of every kind, or we are challenged to obey him, it’s as though Jesus is commanding us to fetch the donkey for him, but we know that the donkey is the one from Zechariah 9:9. Knowing God’s bigger purposes, we can share in the joy of seeing them fulfilled. What difficult situation or obedience are you facing at the moment? How can you cooperate with God in it? If you are looking for God’s guidance in some way, this passage shows us very clearly that, unless our hearts are right with God, you will miss the most obvious signs. The passage gives us confidence to share the Gospel. Each of us is made to have Jesus as our King, our lives arranged perfectly like Israel’s history, to enable us to recognise him and welcome him as Lord. When we put our faith in Jesus our lives become like well-ruled countries, he brings order by his law, peace by his grace and fruitfulness by his Spirit. We can have confidence to share this Gospel knowing that Jesus really is the answer people are looking for, and that God has gone ahead of us in preparing them to welcome him.